Do you ever get an idea and just can’t resist making it?? This is how I feel about this busy toddler bag – once the design had formulated in my mind I just had to execute it! My niece is a gorgeous 18 months, walking and enjoying all life has to offer. Naturally this busy toddler bag includes pushchair buckles. I have yet to meet a toddler who does not have an endless fascination with buckles! 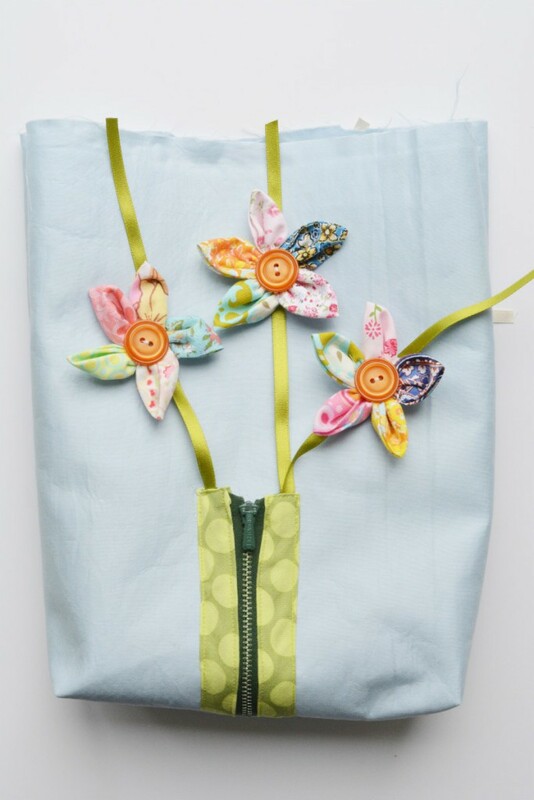 This busy toddler bag not only uses lots of fabric scraps it incorporates a buckle, magnetic snaps, velcro, buttons and a zip. These are all great for developing manual dexterity. The bag is designed to be visually appealing, created with a bright flower design front and back. 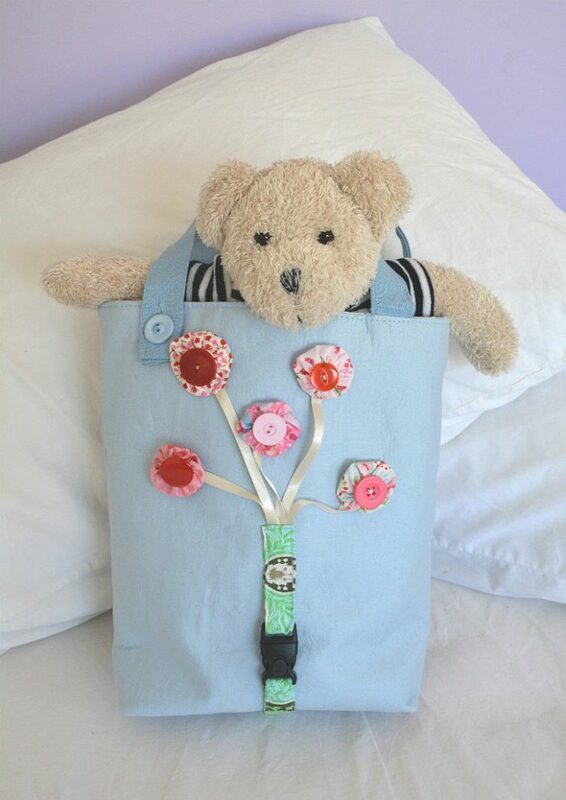 This busy toddler bag makes a great gift and is perfect for using fabric scraps – naturally I could not hang on until my nieces birthday, I just had to give it to her now:)!! To make the flowers, fold the circle in half and then half again. Gather stitch along the curved edge through all layers of fabric and gather up. Repeat so you have created five petals. Tip – continue in the one thread so they naturally joined together into the round. On the back sew on a small circle of felt, with velcro dot in the middle. On the front sew on a button. Make a further two flowers. Zip – Enclose the zip in a complimentary fabric. Fold you fabric in half, press, open out and then press in the raw edges. Press again with the fabric in half and raw edges turned in. Place the zip inside the opening. Tack the fabric in place, capturing ribbon in the zipper top end. Stitch and remove tacking. Repeat for the other side of the zip. Place to one side. 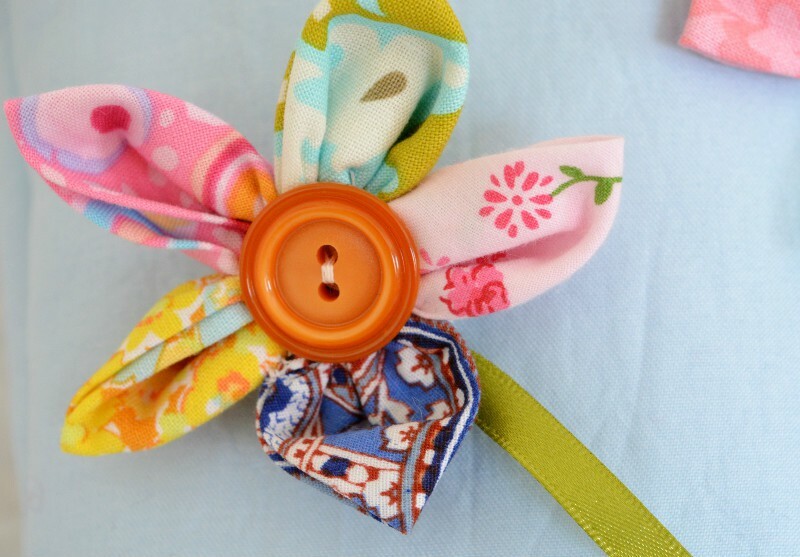 Create the round flowers, iron some iron on interfacing into the center of the flower. Insert the magnetic snap. 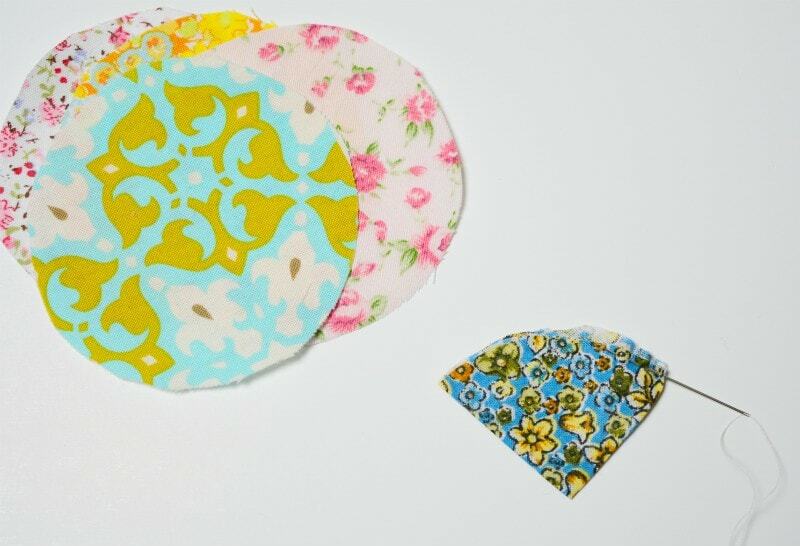 Sew a running stitch round the fabric circle, and gather up. 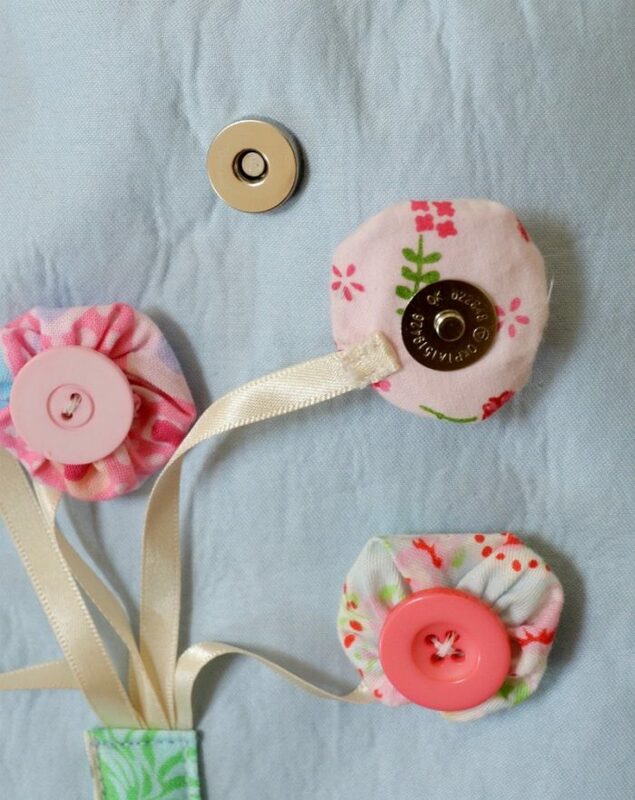 Insert a small circle of felt into the center and secure, this provides a secure piece of fabric to sew your button onto. Sew on the button. Repeat for the other four flowers. Create the fabric buckle strap. Fold the fabric in half, press, open out, turn in edges, open out fold in ends and repress. Iron on fusible fleece to main bag pieces. Sew on the zipper on one piece (centrally), with the ribbons at the top. Stitch down the outer side of the fabric so there is flexibility when the zip is pulled. 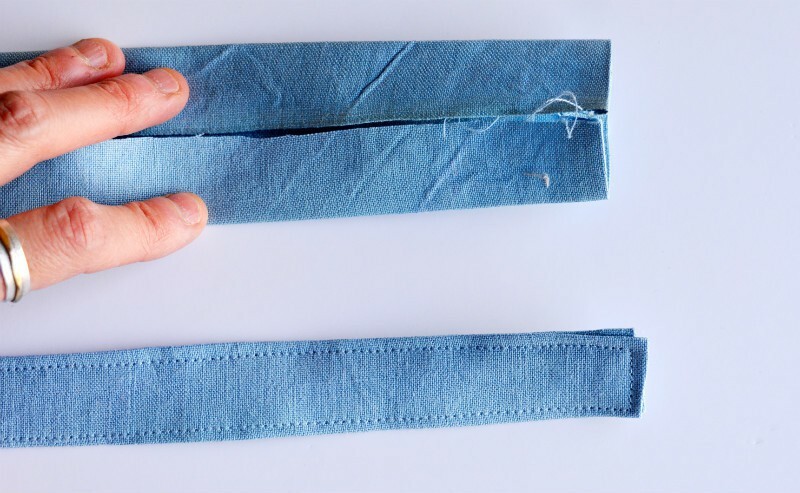 Next sew on the straps for the buckle, cut one length of strap to 5″, fold underneath your raw edges and capturing 5 pieces of ribbon at the top. The top of the strap should be positioned approximately 5 1/2inches down from the top of the bag. Add the second piece of strap to the bottom of the buckle, again enclosing the raw edge. Ensure you do not sew too close to the buckle to ensure the toddler has room to open and close the buckle fastening. Place right sides of the bag together, sew down the sides and along the bottom. Create bag base. Keeping the right sides together fold the side seam to the bottom bag seam. 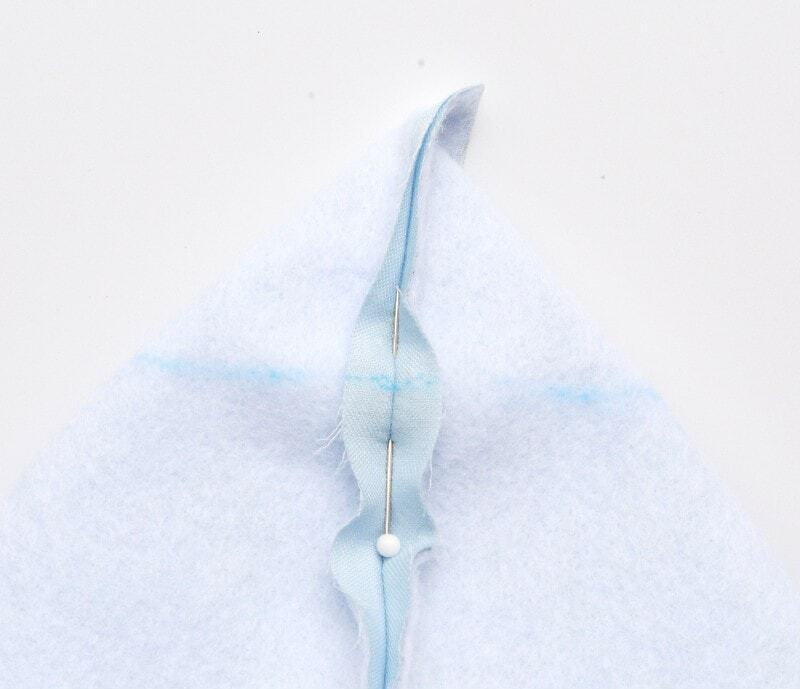 Pin into place, mark a seam 1″ either side of side seam (see image). Stitch. Complete on second side of bag and trim seams. Turn the bag right side out. Place your Velcro flowers. Add the velcro dots to the main body of the bag. 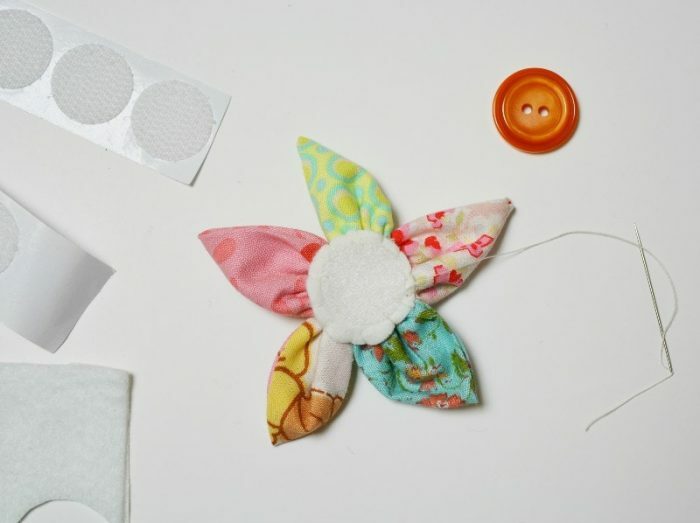 Sew the other end of a piece of ribbon to the back of the flower (trim the ribbon to suitable length). Repeat for all velcro flowers. On the opposite side work out the placement of suffolk puff flowers to be visually appealing. Insert the other side of the magnetic snaps accordingly. 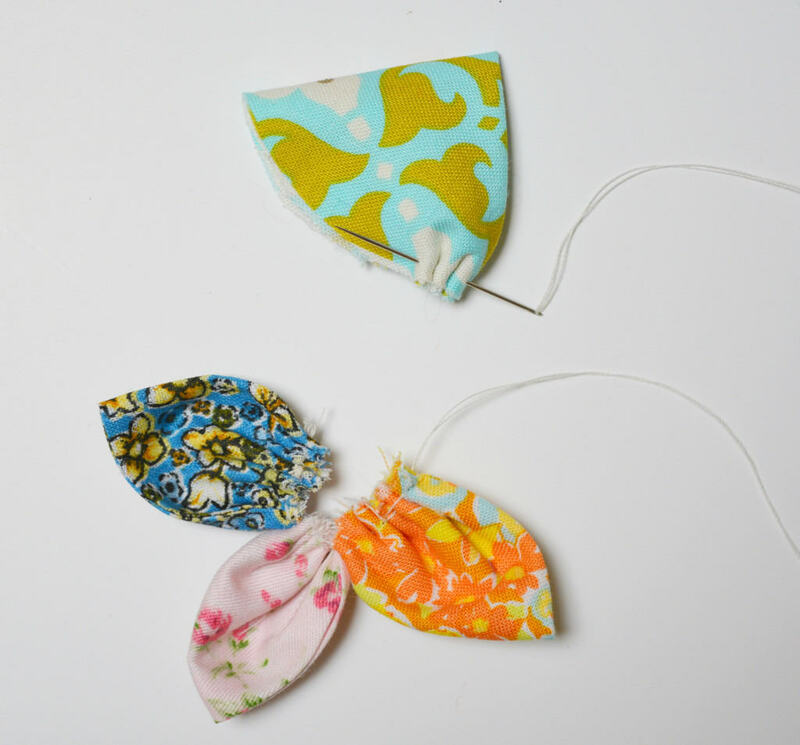 Sew the other end of a piece of ribbon to the back of a flower. 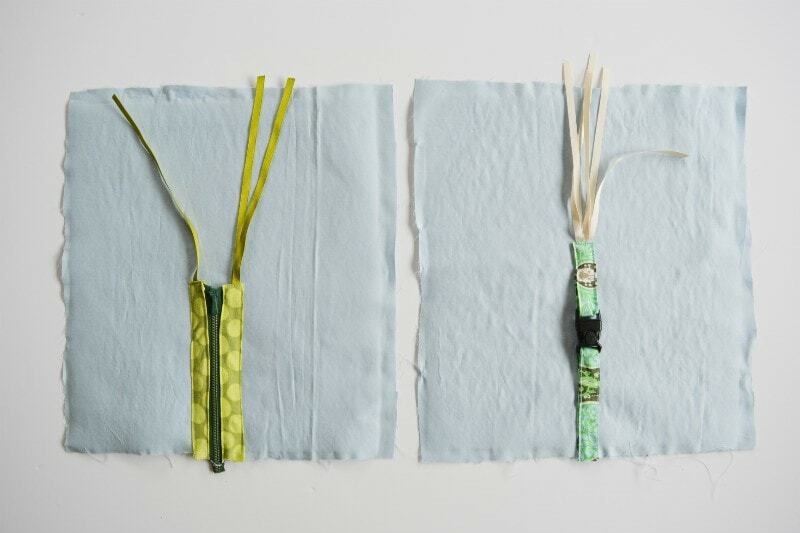 All your flowers should now be attached to ribbon with the appropriate fastenings on the main bag. Next create handles, fold into the middle press, then unfold and fold edges into middle. Press, open out, fold in one end. Refold and stitch. 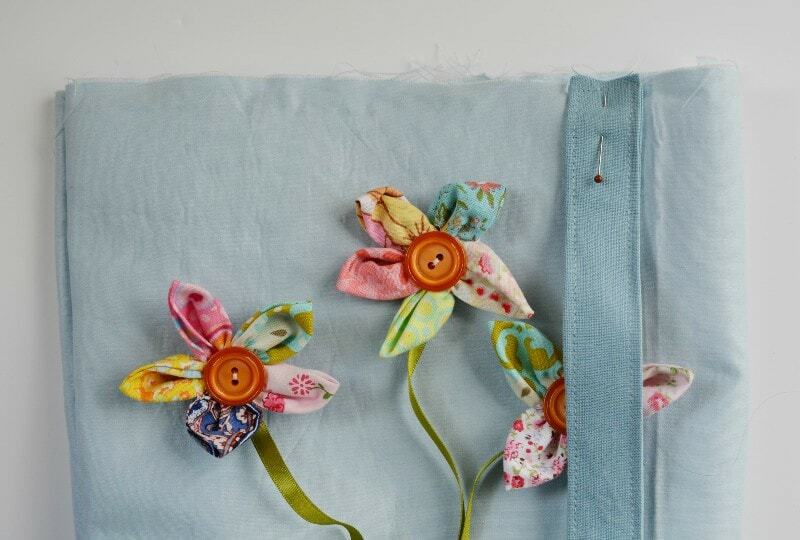 Add a button hole on the finished end. Complete both bag handles. 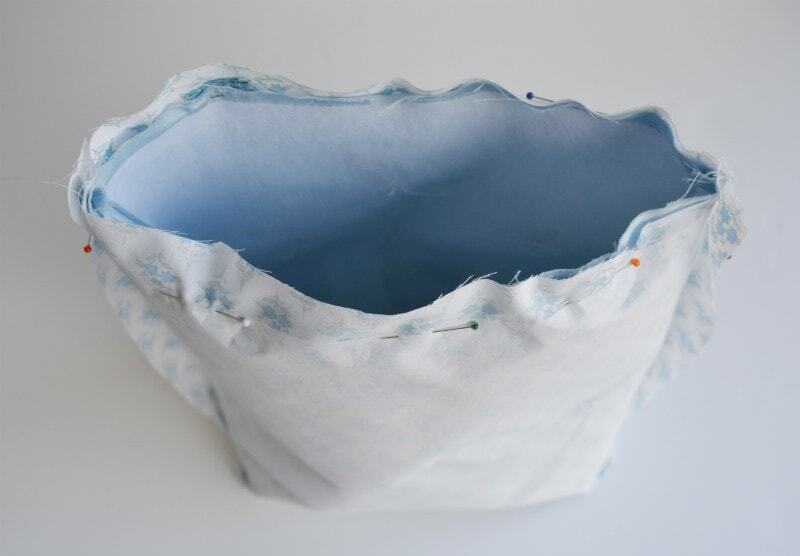 Create the lining, follow the steps as for the main bag sewing the three seams then creating the box corners. Place handle two inches in from the side seam on top of the bag and stitch into place. Add button two inches from the other side seam. Repeat on the other side of the bag. Insert the bag inside the lining. Stitch round the top from the strap round past both side seams leaving a turning gap. Turn the bag right side out. Lastly slip stitch the turning gap and then top stitch the top of the bag. Your done!! I love this idea, since toddlers seem to grow so quickly in and out of toys, making this into a bag extends its shelf life innumerably. Great post thanks so much for sharing. 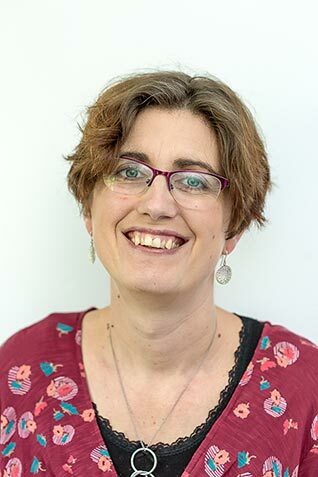 Hi, Vicky – this is so much fun! I love the scrappy petaled flowers with every petal different. Fabulous job! I do love this bag Vicky! Great way to keep a toddler occupied! This is a wonderful idea. Can we sell these at a craft show if we give you credit as the designer ?